I decided to build something different than a dirt box this time. Everyone raves about delays and I have never played or owned one before. I kept looking for a simple delay with parts that are easy to source and inexpensive. The Deep Blue Delay, a digital delay based on the PT2399 designed by Björn Juhl, the owner of BJFe, caught my eye and I decided to build it. Being a member of FSB I quickly found the thread about the pedal. Being a beginner myself and never having tried building a delay pedal before I decided not to try to make my own layout for now and go with what's already there and build mictester's vero layout (you might've to sign up, not sure). I know now that if i don't want this wavey look with the aluminum shining through, i should use a primer. However, in this case that look fit perfectly with the deep-blue, waves, sea, etc. theme. 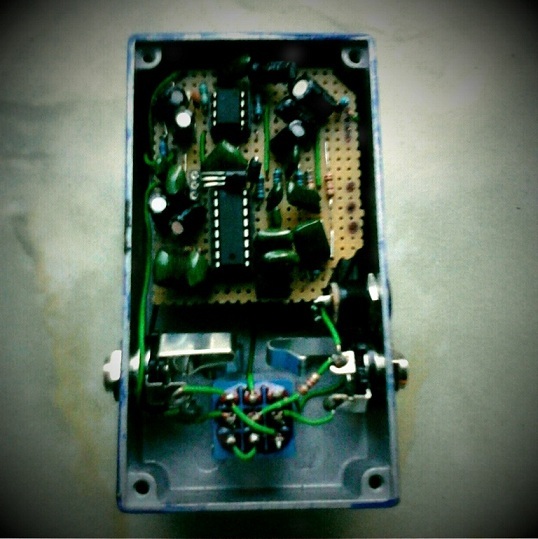 The finished pedal looks like this (this is the one from the header of this blog). I had to cut the vero board a bit and leave out the battery because the layout was pretty big and I wanted to fit it into a 1590B sized enclosure. Building this pedal is highly recommend as it is a pretty easy build for a delay and is tons of fun. I sourced all my parts, including the PT2399, from Tayda because they have the cheapest prices and I've never had problems with them. Update 03.06.13: due to some questions and issues about the stripboard layout, I would recommend to rather build this pedal with the layout Mark from GuitarFX Layouts posted here. It is verified and fits in an 1590B-sized enclosure including a battery. Inspiring post! I'm trying to come up with some graphics for my deep blue delay clone and I'm tired of my regular old straight up text labeling. This would be a good chance to try some blue swirlies. Looks great! This finish is amazing - what'd you clear coat it with? @Kato: Thanks! Glad you like it, although it was more of an accident with the blue paint ;) Drawing letters with a brush isn't as easy as I thought. @Pegasus: I know what you mean, c3 and r8 share a hole at i2 on the vero. so just stick both legs in the same hole and solder. @Tristan: It's clear coated by brush with simple shiny acrylic clear coat from the craft shop. In your layout the 2 DGND pins (4&6 on the PT2399) are not connected to the AGND, is this correct? yes (pin 6 is not a DGND but VCO). Works that way, haven't tried grounding pin 4. Not sure if there will be a noise difference (I have found both layouts). Hopefully my Tayda package will arrive soon so I can start experimenting! thanks! To be honest, I posted this layout because that's what I used, but if I'd build it again (and I might), I would definitely use the one Mark at tagboardeffects posted. That one after the update also has the AGND and DGNG grounding. Hey people, if anybody wants, i created professional pcb (Im only 16y old :DD) for that, with silkscreen components values as text layer and one-sided pcb ready to print mask (file extension is .xps, win7 can open it without installing any program) and you are ready to print for photo-way pcb. Send me an email, i will post you anything what you want about this pcb, as .pcb file that you can modify in ExpressPCB (best and f****n´ EASY program), i can send you xps ready-to-print file of silkscreen or bottom copper layer... My email is yeayer555 (a) seznam . cz. Seeya! Where is the r19 resistor from the stripboard? Is it supposed to be the 100k from the output to the ground? no there is no R19 on the stripboard, you're right. Remember this is not my layout, and the schematic doesn't show a 220k resistor. The 100k from output to GND is optional and I added it in my version to the stripboard (it's originally not on there). Hi! First of all, I just want to give you my congratulations for the good post! I tried to build the pedal yesterday but I had a problem with the REPEAT knob. The problem is that when I turn the knob to the left, a big noise starts and gets higher and higher until I turn the knob totally to the right. The other two seem to work properly. 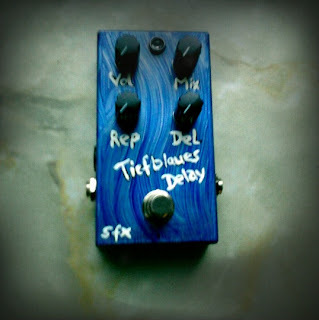 Hi , Sorry I am still learning i wonder if you could help , I was going to build The Deep Blue , from FX guitar Layouts . With the added volume mod. I didn't understand how to ground this build is there something I must do differently . Best Regards Stu. in this stripboard layout, the ground is called "batt -", but it works just like a regular gnd. In the Guitar FX layout it is called "gnd". Look up the standard pedal wiring and connect all grounds to the enclosure via the rings on the jacks. Hi, I’m a bit confused, you mean that the ground should be connected to the negative part of the battery or “batt -“ is the ground? If so, where should I connect the negative of the battery? (Sorry for my English, I’m from Spain (; ) Thanks for the post. Regards. Look at the schematic. Batt- is GND on the layout. hive this layout and it works but the mix distorts and the repeat goes crazy I have pot 6mm green stereo but I only use 3 pin and if I put them as the scheme they work in reverse. ptc is Chinese and tl and ws 78l05.la position of 78 is correct. I do not know what can be the only mod is a cap of 2n2 I put 1n8 had no stock.sera gnd ?? problem. I already manufactured it and it is the same but if I do not remove it the 9dc jack and I put it again Push pull does not work.It is as if the capacitors were not discharged.It is not going to the 2 time and it goes without 3pdt. Funciona pero para arrancar motores tengo que hacer push pullman unas varias veces sino no va.luego va perfecto. Perfecto And Mod of por 50kb Volumen información R5 And ok .thanks good Delay.